Foireann cispheile na mbuachaillí F16 i Leathcraobh na hÉireann!! !U16 Boys basketball team have reached the All Ireland Semi Finals!!! Tá foireann na mbuachaillí ag déanamh go hiontach i mbliana. Táimid anois ag baint fómhar an obair uilligh atá curtha dóibh ag an grúpa imreoirí seo le cúpla bliain anuas. Dhá bliain ó shoin ní dóigh liom gur bhuaigh an foireann F16 aon cluiche ar chor ar bith (ceann amháin b’fhéidir), anuirigh bhain siad leath a gluichí agus i mbliana tá siad i ndiadh gach cluiche a bhaint go dtí seo. Tá siad i ndiadh an leath-craobh a bhaint amach i gcomórtas craobh na hÉireann. Bhí cluiche inné acu in aghaidh St. Vincents ó Ghlasnaíon Baile Átha Cliath. Scoil atá clú maith orthu i leith spórt agus ar nóidh cispheil. Cinnte is láidir go maith a bhí an foireann a sheoladar síos chugainn. Ach is treise fós a bhíomar. 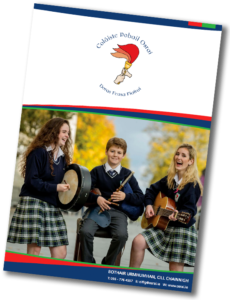 Ní raibh ach 2 phointe idir na fóirne ag an deireadh, ach tá a fhios againn go bhfuil cuideanna donár imirt a féidir linn a fheabhsú go héasca. Árd moladh tuillte ag na leads! D”imir muid cluiche sraithe in aghaidh Arklow 10 nóiméad i ndiadh dúinn bainnt ar St. Vincents. Ainneoin cosa traochta, d’éirigh leo an bua a fháil – rud a fhágann an deis againn críochnú ar bárr an grúpa sraiteh gan ach cluiche amháin fágtha. Fágfaidh sé sin muid i gcluiche leathceannas sraithe réigiúnda in aghaidh an dara foireann ón ngrúpa eile. Baill fóirne ; Rónán de Buitléar (captaen & treoraí na imirthe), Pádraig Ó Laoighre (garda caithimh/ tosaí beag), Eóin Snyder (garda caithimh), Alan Ó cuilleann (tosaí mór), Pádraig Ó Fearghaíl (tosaí láir), Alan Ó Murchú (tosaí mór), Pádraig Ó hAirmhí (tosaí mór), Dónal Pléamóinn (garda caithimh), Nathan MacÓda (tosaí beag).